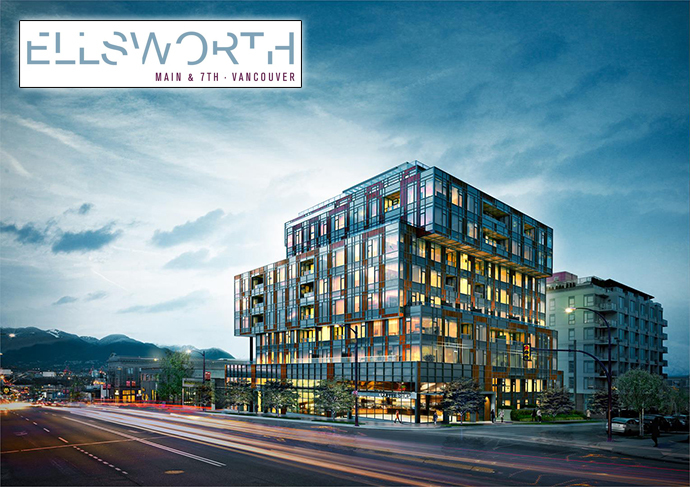 Brought to you by CHARD Developments, the new Vancouver Ellsworth condos are located at Main Street and 7th Avenue Vancouver. This ten storey, mixed use residential development features eye catching architecture, exceptional floor plans and an unbeatable location in one of the best Main Street’s trendiest boutiques, cafes and craft breweries. The Ellsworth Vancouver condos feature only 89 homes for sale that range in layout between studios to family sized three bedroom layouts. They are quintessential Mount Pleasant: hip, fun loving, vibrant and distinct with an eclectic outlook on life and irresistible edginess. The ten storey unique architecture (designed by MCMP) with playfully articulated glass facades with aluminum accents and wood look panels is clearly distinct from any other development in the area. As well, the presale Vancouver Ellsworth Condos will feature a massive 3,500 square foot common roof top terrace with outdoor kitchen (and yes, there will be an outdoor BBQ! ), covered dining area as well as a fire pit with comfortable lounge seating. The Mt Pleasant Vancouver Ellsworth condos will also feature garden plots and a children’s play area as some of the many on-site amenities at this amazing CHARD development. 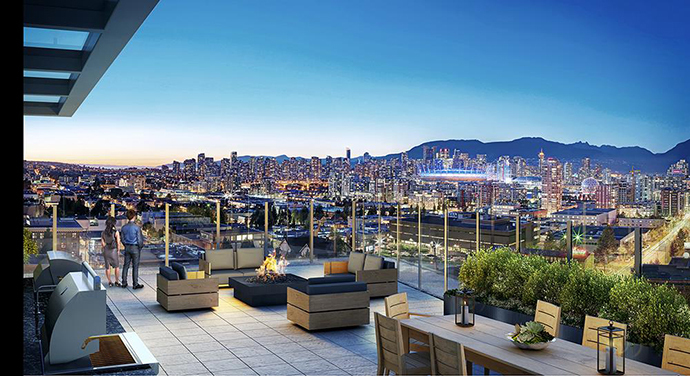 The roof deck will also offer residents great views across downtown Vancouver and False Creek. Some of the indoor amenities will include a multi-purpose room, car wash/pet wash bay, bike storage and underground parking. The Ellsworth Vancouver Mt Pleasant condo presentation centre is opening Spring 2016 at 2106 Main Street Vancouver (at 5th Avenue). The estimated completion date is for mid to late 2018. The price point starts from just $339,900 (please check sales staff for any changes) with floor plans that range in layout between studio/bachelor to three bedroom family sized homes. Another really great feature of this project is that the developer will include curated displays of original artwork throughout the lobby and common hallways. For more information, please visit www.ellsworthvancouver.com or you can simply register on this page and we’ll send you updates when they are released. The enviable location at Main & 7th in Vancouver’s Mt Pleasant district serves as one of the best features for this new CHARD Development. The Ellsworth condos in Vancouver will introduce only eighty nine opportunities for home buyers with a great range of bachelor layouts to 3 bedroom floor plans priced from the low $300’s. The expected presales launch is for Spring 2016 (possibly in March). The striking exterior rises 10 storeys over Main Street and The Ellsworth condos in Vancouver reflect the progressive sophistication of the historic and thriving neighbourhood. Boutique, elevated living in this most sought after East Vancouver community is all that prospective home buyers talk about. Within walking distance are retail boutiques, craft brew pubs (just steps away from the Main Street Brewing Company), coffee shops, bistros, shopping, banks and much more. In addition, the Mt Pleasant Ellsworth Vancouver condos are within walking distance to Yoga on 7th, the Telus Science World, SkyTrain and bus routes, major transit routes, downtown Vancouver, SFU, UBC and the rest of the Lower Mainland. There’s a lot going for this Mount Pleasant condo project, so visit their sales centre for more details and check out the area this weekend! The interior design is by BBA Design Consultants and will have a modern look and feel to the colour schemes. The ceiling heights will range between 8’6” to 9’0” (over height). Inside, the Ellsworth Vancouver condos will feature kitchens with pantries (great storage! ), fully integrated Blomberg and Fish & Paykel appliances, as well as innovated water based heating and air conditioning system for personalized comfort year round. All the little details are taken care of in your new home. As well, Chard Smart features thoughtful and above and beyond amenities to help you live smarter. Some of the great features include a dog wash station with hot and cold water, a maintenance bench in the bike room and USB charger outlets in both the master bedroom and kitchen. Dimmer light switches are also included in the kitchens and dining room for energy savings and ambience. The Ellsworth will be the premier condo development in the East Vancouver Mount Pleasant area in 2016, so make sure you register today to find out more about this amazing CHARD development. The presales are expected to begin in early Spring 2016 with completion estimated to be around mid 2018. The presentation centre for Ellsworth Mount Pleasant is at 2106 Main Street Vancouver. Don’t miss out on this great project!